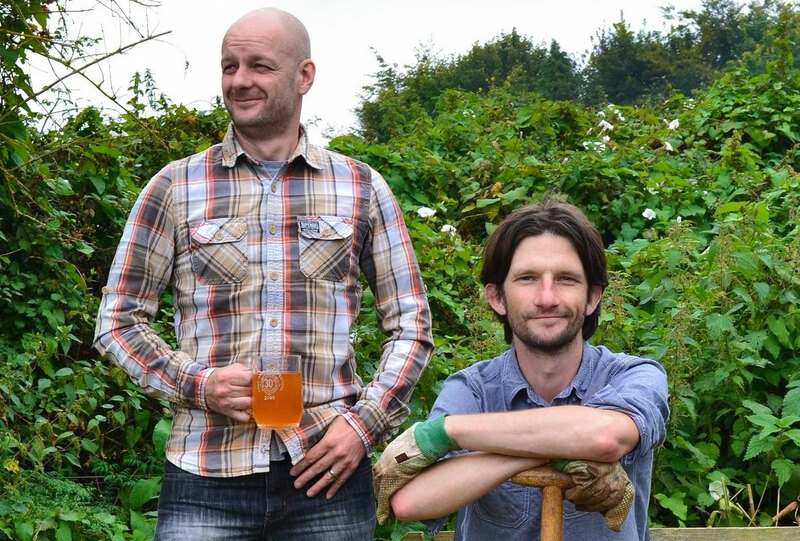 This summer blazed a trail of heat that we’re not normally accustomed to but, now the nights are getting longer, we’re starting to think about evenings in front of the log-burning stove. 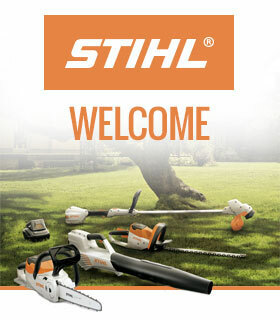 Which means now is the best time to get your log pile ready for action. Before considering what type of log storage you’re going for it’s important to decide where you’re keeping it. The most sensible spot is as close to your door as possible – long treks across the garden at night can be treacherous, especially if you’re loaded up with an armful of timber while navigating an icy path. If doorside space is tight then consider a smaller storage option that will hold enough wood and kindling for a week, with the main pile located in a more convenient location – and remember to keep it topped up on a regular basis. What size logs are best when it comes to storing and burning? 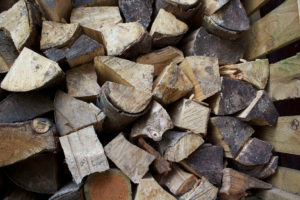 It may be tempting to try and haul the largest log you can find on the fire and watch it burn all night but it’s not only likely to damage your stove but there’s a greater chance it’ll be harbouring some damp. That’s because small logs dry out more quickly. 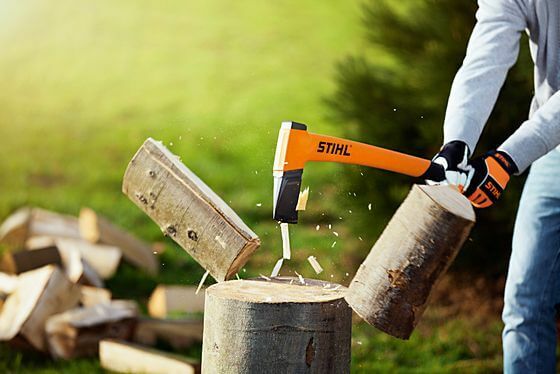 So before you stack any logs it’s advisable to chop them down to size in plenty of time before you need them. If you don’t fancy buying or building a storage shed for your logs then the best way to protect them is with a waterproof sheet pinned over your pile. But before you hastily encase them in their protective layer it’s important that they’re properly stacked. To start with, try and get them off the ground – particularly if they’re on bare earth – so air can circulate underneath. A wooden palette makes a suitable base. Just as you want air to circulate underneath the logs, you also need it to move through the whole pile. So stack your logs in an orderly and tidy manner (to avoid jenga-like collapses when you remove one) but allow gaps to naturally develop as you build. When it comes to covering the pile with your waterproof sheet, make sure the air can get into the pile by leaving gaps on all sides – cover just the top of the pile and keep it secure by pinning it with ropes, as with guide ropes on a tent. If you’re planning on buying or building a more formal-looking construction to protect your logs then there are a few points to bear in mind. As air circulation is key, the sides and back should have gaps between the slats and the base should be raised from the ground, again with a floor that has gaps. The roof, on the other hand, needs to keep water out so that must be solid and sloping away from the front of the store. Covering the roof in felt or another waterproof material will help protect the shed for longer. Fitting a shelf below the roof also provides a useful spot to keep kindling separate from the logs. By having an open front you’ll have easy access to stack and remove logs and, providing the roof gives a good coverage your logs, they will be protected from all but the worst of the weather. If you’re concerned about horizontal rain then you could also fix a tarpaulin curtain. Pin it to the top of the wood store and provide a method for keeping it closed when required – a timber baton at the bottom will weight it down or you can secure it with hooks fixed to the base of the store. Just make sure to leave it open as often as possible for that all-important air circulation. Most people put their log stores against a shed, fence or house wall. If you’re doing this be sure to leave a gap between the store and fence or wall – there’s no point in creating good airflow within the structure if you’re going to block it off by jamming it against your house. 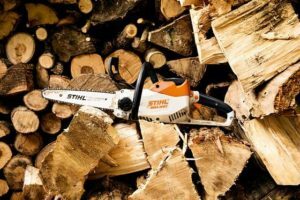 With your store in place and logs neatly stacked you’re ready to cast logs into your fire but, before you do, we have one final tip: bring the logs you’re planning on burning into the house 24 hours before you use them. This will give them a final drying-off spell away from the cool outside air and ensure your fire roars to maximum effect. 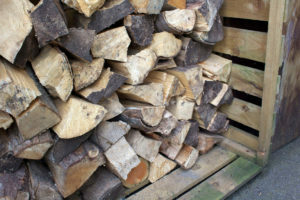 Have you got any other tips for storing logs over winter? We’d love to hear from you, so share your tips in the comments below. Thanks for the comment Terry, we’re glad to hear you’re enjoying the posts!